St. Johns Marine Group LLC. was established in 2016 as a parent company to St. Johns Boat Company, Dixie Towing LLC, and W&D Ship Deck Works Inc.
St Johns Marine Group is operated by Founder and Owner Robert K. Gibbs, and Co Owners Robert P. Birtalan, and Robert K. Gibbs Jr. Together, the Management team has over 100 years of Maritime experience to offer its valued customers. Please navigate this site to find more detailed information about our companies and links to the company sites. Established in 2016 St. Johns Marine Group is a Holding Company which wholly owns its subsidiaries Dixie Towing LLC, W&D Ship Deck Works Inc., and St. Johns Boat Co. Together the companies offer Full Service Ship Repair, Vessel Operating and Management, Contract Towing, Commercial Diving, and Salvage. 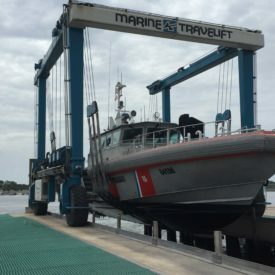 Established in 2006 on the former Daly’s Boatyard site, founder Bronson Lamb III rebuilt the old yard and began offering 110 Metric Ton Travelift service. 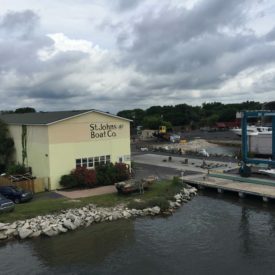 In 2016 after several years of growth at Dixie and W&D, along with aspirations to expand the business further, St. Johns Marine Group purchased St. Johns Boat Co. Established in 1980 Dixie has successfully operated a wide range of towing vessels and barges for both Commercial and Government Customers. Our experience includes inland barge freight, coastal towing, construction and dredge support, ship assist, as well as many special projects. Dixie began offering Commercial Diving services in 2013 and has since performed many repairs and maintenance to vessel hulls, and underwater structures. W&D Ship Deck Works Inc. Established in 1980 W&D began as an interior deck system and habitability contractor for Naval Vessels stationed in Mayport Florida. In 2013 Robert Gibbs and Bob Birtalan purchased the company as an opportunity to revitalize a struggling organization in addition to gaining a foothold in the Ship Repair community. Since the acquisition, W&D has developed a good reputation for offering quality production at a low cost. 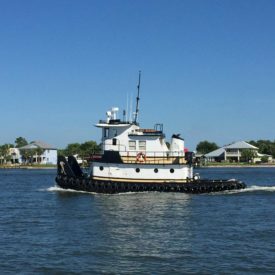 Robert Gibbs began Dixie Towing in 1980 and grew the company from one boat the Atlantic Endeavor to four boats and five barges by the end of the 1990s. 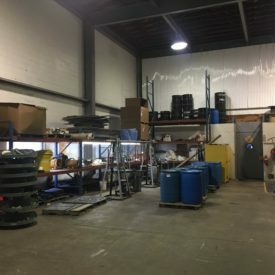 In 2014 Robert purchased W&D Ship Deck Works Inc. as an opportunity to diversify his business beyond marine towing and expand into mobile ship repair. After a few years of success performing repairs and modifications to US Navy and Commercial Vessels Robert discovered a need for a waterfront facility where he could further his business beyond mobile repair and become a full-service ship repair company. In 2016 Robert purchased St. Johns Boat Co. and created St. Johns Marine Group as a holding company to consolidate the three businesses. Robert Birtalan or “Bob” as he is known in the industry began working at Atlantic Marine in 1982 and held many positions within the company including Project Manager, Yard Superintendent, and ultimately became head of the Atlantic Marine Mayport Division. Bob retired from BAE Systems in 2012 and in 2013 was approached by Robert Gibbs to consult on his perspective purchase of W&D Ship Deck Works Inc. Bob ultimately decided to collaborate with Robert on the purchase of W&D and quickly became invaluable to the company’s success with his wealth of ship repair and government contracting experience. Sharing Robert’s same visions Bob has maintained his partnership with the acquisition of St. Johns Boat Co and continues to be an active member of the management team. Robert K. Gibbs Jr. began working for Dixie Towing full time in 2011 although he never missed an opportunity to ride one of his father’s tugs as a child. With the guidance of his father and some local shipyard workers Robert Jr. fully redesigned and rebuilt the tug Atlantic Endeavor over the course of two years in the time between his college classes. In 2014 Robert Jr. took a larger role within Dixie Towing overseeing all maintenance activities on the tugs in addition to scheduling the jobs and managing the crews. Robert Jr. developed a taste for ship repair over the last few years, and eagerly joined his Father’s mission to develop a full service ship repair business.